I've been writing magazine articles and books for a few years now and have gotten do some cool stuff along the way. One highlight: I got to drive Bobby Isaac's K&K #71 on the road outside the Talladega raceway. 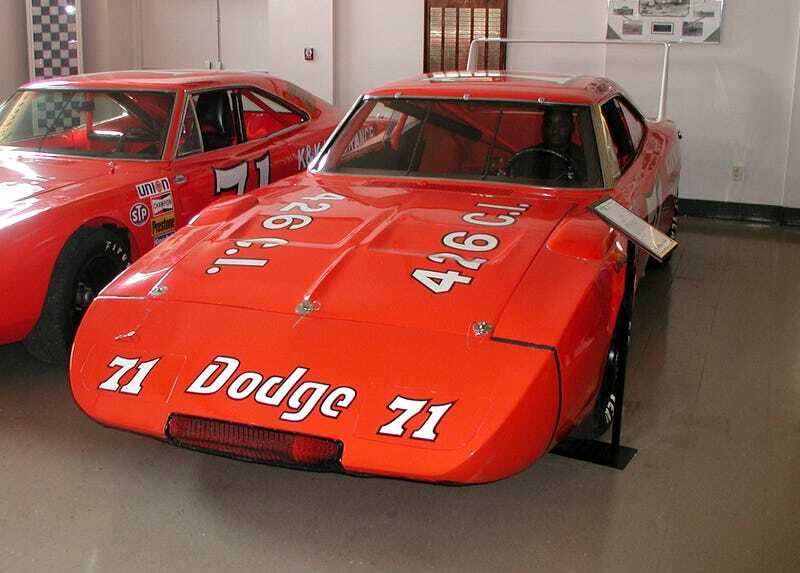 First seen at Talladega in the Fall of 1969, the "poppy" red Charger Daytona was one of a few winged entries in a race tarnished by a drivers' strike. Petty, Pearson, and the other big names sat out but Isaac – not a member of the union – raced. As did the eventual winner, Richard Brickhouse, also in a winged car. There is a whole story there as you might imagine, but I am going to focus on Bobby's car here. The Daytonas raced through the 1970 season and then NASCAR passed a new rule saying you could have wings and nosecones OR Hemis – but you couldn't have both. Yes, Mario Rossi tried to teach Bill France a lesson and entered a winged car with a small-block in the 1971 Daytona 500 but he did not finish. The NASCAR contingent of winged cars was sent to pasture that year. Earlier, Chrysler had taken their factory winged car to Talladega and run the first official lap over 200 at 200.447. Isaac and crew returned to Talladega and ran a few laps of their own. One topped 201. Not many people seemed impressed. Being the second to break 200? Bobby Isaac and his crew – including legendary chief Harry Hyde – went to the Bonneville Salt Flats with their wing and invited an official from USAC. Bobby did a flying mile at 216 and ran laps around a staked-out oval for a few hours to set records at various distances up to 500 miles, much of it spent simply sliding at full throttle around the curves. Afterwards, the K&K car was sent around doing various promotional events and ended up at a car dealer in Alabama. Tim Wellborn, a Mopar car enthusiast if there ever was one, heard about it and acquired it. When he got it, it did not have a running race motor. Sometime later, Chrysler contacted him and asked him about using it for modern day PR. When he mentioned it needing a motor, they scrounged up a crate motor for him. The car is now self-motivating again but the new motor is a bit larger: it is a 528 CI Hemi. And if you like numbers like this, it has a 2.71 rear end. I met Tim at an Aero Warriors convention at Talladega and I hinted that I'd love to write a story about the car someday, and driving it would really make the piece work. He said he'd see what he could do to accommodate me. Shortly after, I was there with a photographer from Mopar Action. Tim fired the car up to pull it outside. I was standing next to one of the front fenders not far from the exhaust pipes. It was one of the loudest noises I have ever felt. Outside, Tim got in and I climbed into the passenger side. The car only has one seat so I got to sit on the floor and hang onto a piece of the roll cage as he pulled it out onto the road and ran it through the gears. It was a blast. After a couple of passes, he asked if I wanted to drive it. We switched places. I quickly discovered that I am a bit wider than Bobby Isaac must have been as I wedged myself through the window into the driver's seat. I fired it up and pulled back onto the road. The first thing I noticed was that the car did not want to steer at low speeds. Those gigantic Goodyear rollers want to go straight until you get going a bit faster. I walked it through a few gears – as I might have driven the Jeep Wrangler I owned then – when Tim suggested I should put my foot "into it." I did. The car has no speedometer so I really have no idea how fast I was going. The car has no brake lights, turn signals, license plates or a variety of other details Alabama state troopers might have liked to see if we had crossed paths. But we didn't that day. After two passes of a few miles each way, I got back out and we all took some pics of the car. I wrote an article about the drive for Mopar Action magazine (the cover photo was shot by Cliff Gromer of Mopar Action) and have stayed in touch with Tim. He has since opened a muscle car museum in Alexander City, Alabama where he displays his huge collection which includes the K&K #71 (which is lent out to other museums from time to time), a few other wings, and a large number of Hemi-powered cars. If you are ever in the area, drop in. It is well worth the visit. If you see the K&K #71, know that it runs and drives, and it gets out from time to time. And it is a BLAST to drive.